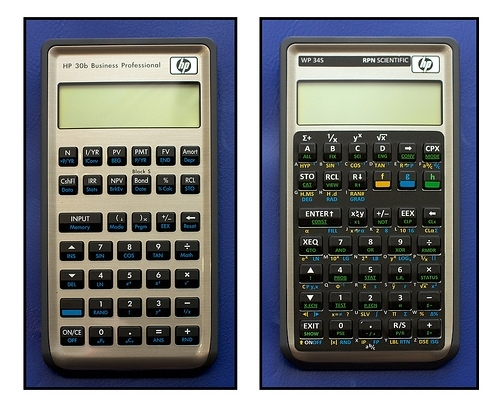 As someone with a bit of an obsession with Hewlett Packard Reverse Polish (RPN) calculators, I’m always on the lookout for a way to avoid having to actually use my favourite machines. To put that remark into context, old HP calculators now sell for a lot of money on eBay and for that reason I don’t like to take them to work and leave them lying about. 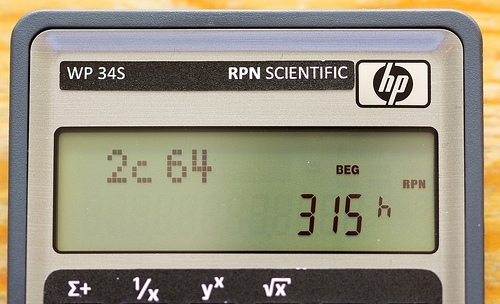 So when I read about the WP 34S project run by Marcus von Cube, Walter Bonin and Paul Dale which uses a modern HP financial calculator as the starting point to create an advanced scientific RPN calculator, I was eager to give it try. The design of this calculator is inspired by the HP-42S calculator which is a joy to use and sells for crazy sums on eBay but is also available in the form of the fantastic 42s application on the iPhone if you want to play with one. A ‘donor’ calculator - either a HP-20b or HP-30b business calculator. I went with the HP-30b which has a better display and keyboard and is therefore more expensive. Using the black HP-20b is aesthetically more appealing, but I’m quite pleased with the HP30b. A serial programming cable (not JTAG as I originally thought but a custom HP part - thanks to Marcus for the correction). I got mine from Gene Wright. Atmel’s set of tools for programming the Atmel SAM3, SAM7 and SAM9 ARM-based microcontrollers. More about this later! The WP 34S firmware zip file. 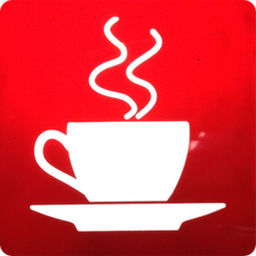 A keyboard overlay from Eric Rechlin. I have been so impressed with the enthusiasm and commitment of those involved with this project and it’s been a pleasure dealing with Marcus, Gene and Eric and learning more about this project via the HP Calculator forums. Once I had all the required bits together the first thing I did was to fit the overlay, covering up the original keyboard functions. I have to say it felt great (in a nerdy way) replacing those nasty brackets and the equals key with proper stack manipulation keys and an ENTER button! The photograph below shows the before and after results. The quality of the overlay is really great. 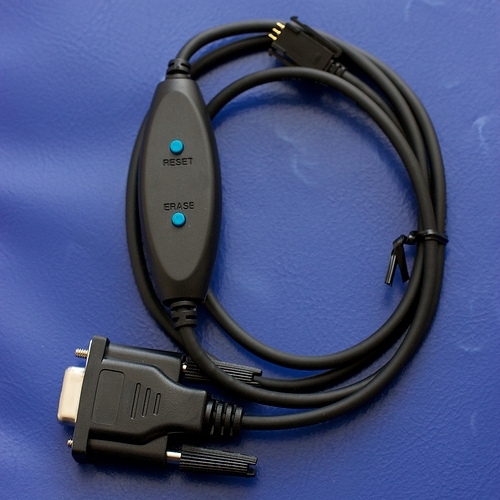 The cable below is the JTAG serial programming cable which is needed and includes Reset and Erase buttons which are used during the flash programming. 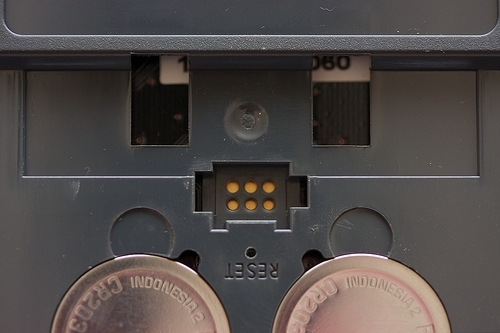 The programming post is a small connector with the calculator’s battery compartment. Although I believe it’s possible to reprogram the calculator using Mac OS X or Linux, I decided to stick with Windows for the moment to keep things simple. At this point things got slightly trickier. The WP-34S quick start guide and programming documentation refers to using Atmel’s tools for programming ARM-based microcontrollers but these didn’t work well when I tried them. With some expert help from Marcus Von Cube on the HP Calculator Forums, I downloaded the open source Flash Tool for the WP-34S and this is very much simpler to use — basically just select the COM port and the file to be loaded and send the file to the (by now erased) calculator. The whole thing takes less than a minute to reprogram. I think it’s just a case that the documentation is slightly behind the engineering in this case. Having worked through these teething problems, future versions of the firmware will be a lot quicker to program and I am very happy with the result. I have a very advanced scientific calculator that’s not irreplaceable, is well supported and being actively developed and with the capability that I need. It has been an very satisfying little project and one that I will get a lot of use from it.